A yawn is a simple behavior, a reflex, with specific physiological functions. We are not the only ones yawning. Chimpanzees, bonobos, macaques, and dogs, among others, yawn as well. Although a simple behavior, yawning performs social functions as well. It is contagious, not only within a group of individuals of the same species but also across species as in the case of humans and dogs. The original function of the yawn is not clear, several explanations being equally probable. One study suggests that yawning brings an influx of oxygen to the blood when it contains increased levels of carbon dioxide. Another explanation focuses on a particular necessity to stretch the muscles in the tongue and neck. A third interpretation suggests that yawning helps to keep one alert, a crucial condition for any predator to be successful. Since social predators need one another to succeed, yawning developed into being contagious (through natural selection) because of the benefits it confers. Another suggestion is that yawning helps to control the temperature of the brain. Some studies point out the connection between yawning and the neurotransmitters, e.g. serotonin and dopamine, that affect various emotional states. That could explain the pacifying function of yawning. The simplest explanation for yawning being contagious is that the mirror neurons in the frontal cortex of various vertebrates, including humans and dogs, activate the corresponding area in the brain of others. Studies have shown that this mirroring effect occurs not only within the same species but also across species. Mirror neurons may be the ultimate explanation for imitation and allelomimetic behavior. 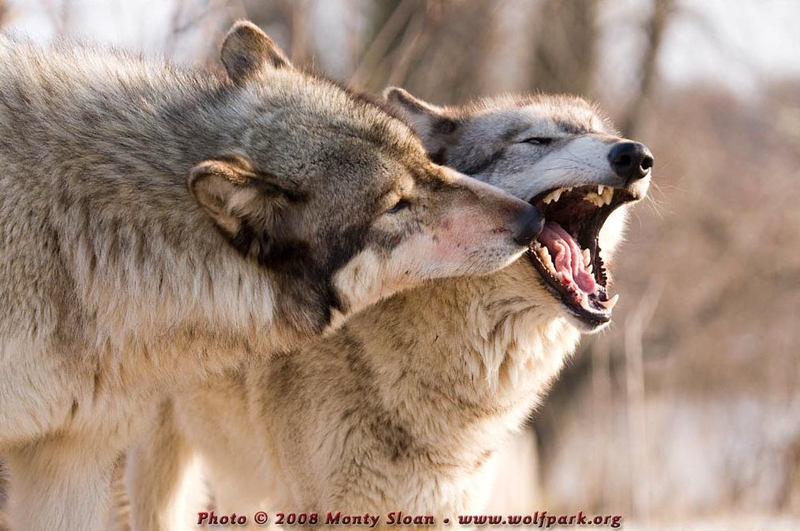 Wolf yawning, a behavior shared by wolves and dogs and also common in other species (photo by Monty Sloan, Wolf Park, Indiana, USA). Dogs yawn and studies have found that they are more prone to yawn when their owners yawn than when strangers do the same. These are serious studies conducted at the universities of Tokyo, Porto and London’s Birkbeck College. They discarded the possibility of the dogs’ yawning being a stress response by closely monitoring their heart rates during the experiments. The dog’s yawn is similar to ours. It is often followed by the same characteristic sound. Yawning is popularly associated with tiredness or boredom. In reality, it can be an expression of embarrassment, insecurity, excitement, and relief. Some humans yawn when they are in love, which can be embarrassing if it is mistaken for boredom! Dogs may yawn when they are tired, but their yawning functions usually as a pacifying behavior (of themselves as well as an opponent). As we see in many other cases, a behavior originates with a particular function and acquires other beneficial functions later on. Yawning became a signal of friendship, of peaceful intentions. For example, a male dog may yawn if the female snarls at him during the mating ceremony. A self-confident dog yawns showing friendliness to an insecure opponent, and vice versa. Dogs yawn to us with the same functions and results (if we register it). They may also yawn as a displacement activity. 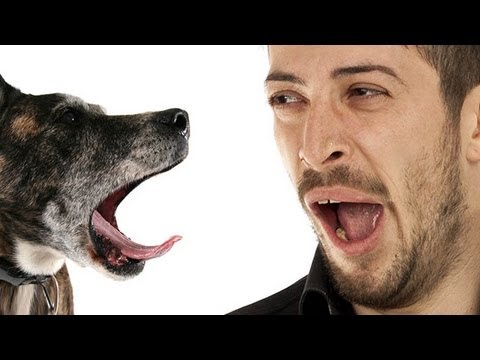 An owner scolding his dog is a typical situation where we can observe a dog yawn. In some critical training situations prone to error, like in the so-called ‘stay,’ the behavior of the owner causes the dog to feel insecure. A yawn is likely to follow, together with licking and muzzle-nudging. When the owner changes behavior, say, by using a friendlier tone or more relaxed body posture, the dog ceases to display those pacifying behaviors. So, yes, your dog yawns at you showing that it is friendly and peaceful—and you can safely yawn back confirming that you are as well. Once again, don’t worry if some find it silly. Yawning, champing (chomping), licking your lips, squeezing your eyes shut, pouty mouth, the canine muzzle grasp, all work—and all communication means are valid as long as they promote understanding, wouldn’t you say? Do We Understand What Behavior Is?